This article will give an in-depth examination of assessing musicality skills in a scientific approach. Musical abilities are often described in words: for example, “She has good relative pitch” or “He has a good feeling for rhythm.” Neither “good,” nor “relative pitch,” nor “feeling for rhythm” is a quality specified through quantitative analysis. Although the value of rhythm in music is often underrated, in this article, I focus on pitch. To determine scientific values for pitch abilities, a reproducible method to measure those abilities is required. These measurements should be independent of any music system. In other words, non-musicians should be able to take the test, and the grading of the ability should be general enough that we can use the quantified results to measure progress and make comparisons. Taking only these definitions, we can conclude that pitch ability is best expressed as possessing absolute pitch (often called "perfect pitch"). Simply put, you must possess the skill to recognize and/or produce a sound at a certain highness or lowness. This view may be one of the reasons why absolute pitch – the ability to name any note – is overrated for assessing one's musicality. The usefulness is further limited because it cannot be graded: you either have it or you don't. In the following chapters, I analyze – for each skill – what a test must take into consideration to achieve a scientific look at the ability. Then, I look for a quantitative way to express one's ability. All the considered parameters in the analyses must be observed and/or measured. To derive a meaningful statement, some of the less important parameters can be kept constant. In addition, to avoid errors and lucky guesses, randomness must be applied, and a minimum number of tests is necessary. Finally, at the end of each skill chapter, I propose how a general test could be performed. For simplicity, the examples in this description are still guided by the equal-tempered system. To be valid for all music systems, note names or interval names should be substituted by the more general frequency definitions. In music, absolute pitch has a much broader meaning than I use in this article. The synonymously used term "perfect pitch" in particular is associated with many other abilitie, many of which relate to a specific music system. For example, chord names are dependent on the underlying tuning system and their scales (for instance, the 19-tone equal-temperament divides the octave into 19 equal steps and is thus incompatible with the 12-tone equal-tempered scale; another example is the different just intonation systems). However, the measurement of ability should be independent of music systems and express the achievement grade more generally. The simplest form of absolute pitch would be simply naming the frequency of a pitched sound. However, humans are not living frequency meters, and therefore, we connect the precision of the frequency recognition with music systems. For example, in the equal-tempered system, the recognition accuracy is one half-step, and each note has an associated frequency. Since we can measure pitch on a frequency level, deviations of the ideal frequency can be used to assess one's ability more generally. Deviations can be measured in any music system and therefore used to evaluate ability. A useful frequency range for a test would be C2 to C6. To avoid side effects, the test should use (pure) sinus waves. Volume naturally has an influence on your ability to hear frequencies, but is not really relevant for expressing your pitch ability; therefore, no specific volume needs to be defined. The primary goal of the test is not to determine the minimum tone duration needed to recognize a tone but rather the test-taker’s ability to recognize a tone, so a long duration of two seconds is appropriate. In the equal-tempered system, the half-step is the smallest interval; therefore, a recognition precision of one half-step can be applied for this system. For a more general approach the recognition precision should be given in cents. Since absolute pitch tests require that the participant cannot base the answer on a reference tone (relative pitch), a silence period must be applied before each tone tested. After a silence period of fifteen minutes, it is assumed that you cannot use relative pitch techniques to answer the question. If all the above requirements are met, then the time required to answer the questions can serve as a form of grading and thus best express one's ability. What unit is ideal to use to express one's absolute pitch ability? In most cases, the percentage of correct answers in a sample can be taken to express one's ability. However, since we want to be music system-independent, precision is more appropriate here. In other words, if we accept any answer as valid, then answers that are several notes off can still be used to evaluate precision. So, every answer can be used in the calculation of the score. Since the answering speed is less conclusive, we should merely define a time limit within which an answer must be given. Therefore, the unit used to express this ability should be: cents. 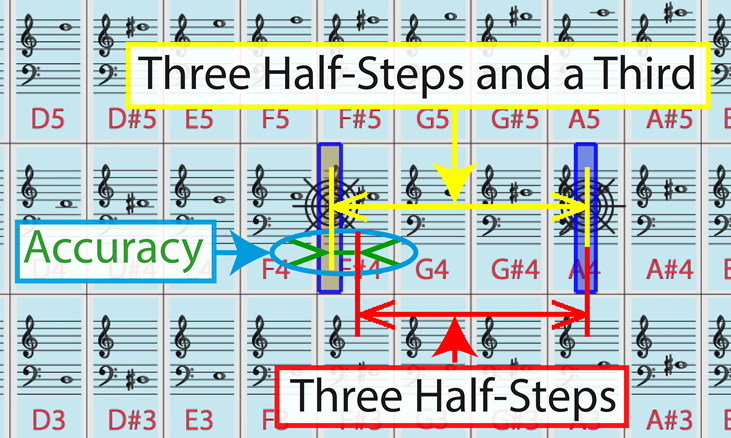 In the equal-tempered system, an octave has 1200 cents, and one half-step has 100 cents. Someone with absolute pitch would then have an absolute pitch ability of 100 cents. People who can identify pitches to a quarter step would have an absolute pitch ability of 50 cents. People who can only identify pitches to the precision of an octave would have an absolute pitch ability of 1200 cents. Since every music system uses octaves, the Western division of octaves into 1200 cents can be applied universally. The requirement of a silence period of fifteen minutes renders an ability test for this skill impractically. Since the silence period is a limiting factor and the usefulness of absolute pitch is doubted and debatable in the first place, I make no proposal for a test. However, in conjunction with pitch production, a partial test of this ability is possible if we assume that to produce correct sounds, recognizing tones is part of the process. See below: Producing Pitch Ability (Singing). Again, this definition relies on music systems. For a much more general definition, we should speak of pitch distances instead of intervals. Pitch distance is a scientific means to describe intervals in all music systems. Volume naturally has an influence on your ability to hear frequencies but is not really relevant for expressing your pitch ability; therefore, no specific volume needs to be defined. In a harmonically played interval, both notes are played simultaneously. In a melodically played interval, the notes are played one after the other. A complete test has to evaluate both types. If the notes are played melodically, then the duration of time until the second note is played must be specified. In both cases (harmonic or melodic), the duration of the tones playtime should be specified. In the equal-tempered system the half-step is the smallest interval; therefore, a recognition precision of one half-step could be applied for this system. For a more general approach the distance precision should be given in cents. If all the above requirements are met, then the time required to answer the questions can serve as a form of grading and thus best express one’s ability. What unit is ideal to express one's relative pitch ability? Here, the big question is whether to use harmonic or melodic intervals. Harmonic intervals are indeed simpler to test, since no melodic time delay has to be defined. Furthermore, in the melodic interval test, an additional component comes into play: The participant must keep the reference tone in mind until the second note is played. However, since relative pitch recognition also implies melodic intervals, I recommend using melodic intervals for an ability test. Since a general scientific relative pitch test should be independent of any music system, the test has to measure pitch distances and not equal-tempered Western interval distances. Therefore, pitch distances beyond the precision of half-steps must be measured. Like for the absolute pitch test, we can use cents. However, since speed is everything for relative pitch, we should score the answer speed, too. Because the relative accuracy decreases with larger distances, the tested range should also be included in the assessment. Therefore, the results should reveal the achieved pitch-distance accuracy in cents, the maximum time needed to answer the question, and a range description in the form of the numbers of the octaves included for the test. Since a general pitch-distance test has to go beyond half-steps and must be independent of any music system, building a system on the Western equal-tempered system does not seem like the ideal solution. However, we can still use the equal-tempered frequencies as base reference points and conduct arbitrary-distance tests from these points. Using equal-tempered frequencies as starting points does not really limit our measuring quality, as we can still measure pitch distances outside of the equal-tempered interval system. For a detailed description of the Pitch Grid Test see the description in the manual for the training program PitchBlitz. The tested frequency range should be adapted to the person's tessitura (soprano, tenor, bass). It should consist of at least one octave. Can be any vowel or even be just humming. The produced sound should be of reasonable loudness. The measured deviation could be used to score one's ability to produce a pitch. This parameter could also be measured and used to evaluate one's conceptualizing speed but is less meaningful and therefore not measured. If the tone to sing is played just before the reproduction, then the conceptualization is minimized, since the participant can adjust their singing to the reference tone without conceptualizing the pitch height. Using a reference tone near the tone to sing is preferred, since they then have to conceptualize a new tone. 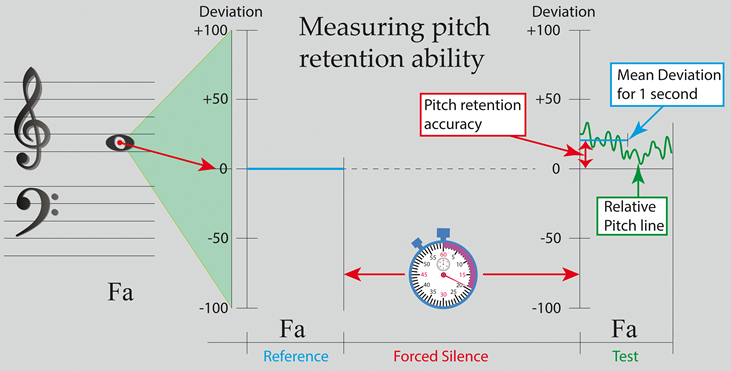 If no reference sound is used, the test could measure one's absolute pitch ability. If you are not allowed to sing the tone immediately after you hear the reference tone, then your tonal memory can be tested. In this case, the reference tone should be the same as the tone to sing, since just before the production of the tone, you must conceptualize it anyway. What unit is ideal to express one's pitch production and remembering ability? If we look at the last requirement – a forced delay time – then we could require a fixed level of reproduction precision, and if successful, we could express one's tonal memory for single tones in terms of seconds. The Pitch Ability Test focuses on the second unit and measures one's tonal memory. The test does not measure pitch production ability; it only verifies that one's produced sound was in the required precision range. Thus, the forced delay time represents the remembering ability. If you set the forced delay time to zero, then you could measure the pitch deviation in cents and interpret the result directly as a pitch production accuracy test. The test starts by playing a reference tone. The participant’s task is then to reproduce the tone after a given delay time. If the deviation of the produced tone is within the required limits, then the participant passes the test. The test then continue with either a narrower limit or a larger delay time. This approach identifies how long one can keep a tone correctly in one's mind before you failing to reproduce the tone within the required limits. If the participant passes the test for a delay time of 15 minutes, then we can say that we have tested their absolute pitch ability. At least, the test confirms the ability to produce a tone correctly even after a pause assumed to exceed human's short-term memory capabilities. The program Same Pitch Please is a training program that helps find the tones you can remember best and verifies whether you have taken over the reference tone correctly by letting you sing back the reference tone immediately after the reference tone has been played. Timbre develops through overtones and is what makes an instrument sound different from another instrument. Each instrument adds overtones to the fundamental sinus wave it generates. For example, a piano has a different mix of overtones and overtone-volumes than a pipe. Adding overtones to a fundamental sinus wave forms the shape of the repeated pattern. Thus, the wave shape no longer has the shape of a sinus wave but can assume the shape of a saw tooth or a square wave. Any shape can be produced by adding overtones with different volumes. The shape of the wave is responsible for the characteristics of each instrument. Since there exist many instruments and each is unique, it is difficult to define the requirements for such an ability test. We could, of course, limit the number of instruments to differentiate by a giving a limited list. However, since most people do not have difficulties in recognizing instruments, an ability test is not of much use. The fact that most people can recognize instruments easily, does show, though, that the brain can handle complex frequency mixes with ease. What is ideal to express this ability? To measure this ability, the percentage of correctly identified instruments from a test sample with a limited instrument list could be used. As mentioned before, a test for this ability would be of limited use. Therefore, I will not propose a solution. However, I would like to point out the importance of the ability to recognize complex frequencies. An example of a highly complex instrument is the voice. In addition to the pitch height, the voice also conveys meaning through words. Just because we hear words does not mean we understand their meanings, which depend on the linguistic context. Even in the same language, words can – depending on the context – have several meanings. Complex frequency patterns are, of course, part of the pitch ability, and a special aspect of a multiple pitch ability is recognizing chords. However, since combinations of three and more tones dramatically increase the number of test cases, a general score would be too broad and thus could not be used to enhance one's chord recognition ability. To make progress in chord recognition, more detailed feedback and knowledge of the music system is necessary. In my opinion, measuring pitch ability only makes sense when measuring the pitch-remembering skill (Pitch Ability Test) or the pitch-distance recognition skill (Pitch Grid Test). But here, the feedback for these abilities can be highly useful. Progress can be made visible through training and thus motivate you to continue with the training. The Pitch Ability Test measures one's pitch-remembering ability and the ability to produce the desired pitch. The test gives people who use the equal-tempered system a small advantage because the notes tested stem from this system. However, keeping a note in mind is a difficult task. Since you hear the reference tone and you have time to seize/internalize the pitch/frequency, I think the test is general enough. You cannot blame the reference tone just because it is not in your music system; your memory has to work for every tone you hear. The Pitch Grid Test measures one's pitch-distance recognition ability. Instead of identifying intervals, the test measures distances independent of the equal-tempered system. The general nature of such a measurement may lead to disappointing scores for people used to do interval tests in the equal-tempered system. However, to satisfy a general pitch-distance accuracy test, the test must include large distances and a broad range (e.g., C2 to C6). The choice of a grid based on the equal-tempered scale seemingly gives an advantage to the users of that system. However, since the reference tones are not always in the equal-tempered system, these users are not afforded any real advantage. On the contrary, absolute pitch possessors of the equal-tempered scale may get confused if, for example, they hear a tone in the middle of two notes. In this case, they must identify the pitch distance of, for example, a perfect fifth that starts 50 cents off the equal-tempered system outside of their usual equal-tempered reference system. Thus, true pitch-distance identification ability is measured: a perfect fifth always has a distance of 700 cents from the reference tone, regardless of the frequency of the reference tone. Scientifically measuring pitch ability can be used in studies to compare and show the correlation of the ability with other values.